What's the Deal with Torticollis? Torticollis is a medical diagnosis involving the shortening of the sternocladomastoid (or SCM) muscle in the neck. When this muscle contracts, it causes the head to tilt TOWARDS the side of the muscle and rotate or turn AWAY from the muscle in the opposite direction. Right ear tilts close to the right shoulder, and the head turns to the left. Note: There are 2 movements in the neck that are caused by the tightening of 1 muscle. Why do physical therapists treat this? When a child is unable to change his/her head-neck position, one side of the neck may become tight. This can lead to a bunch of movement problems. For example, by looking to one side more frequently than the other, the child’s vision contributes to nerve growth for moving. The child will move the side of the body it is looking toward more, lay down more movement nerves in that single direction, and develop asymmetry in muscles and bones. Pediatric physical therapists are experts in observing these abnormal movement patterns and teaching parents techniques to promote optimal growth and prevent disease. 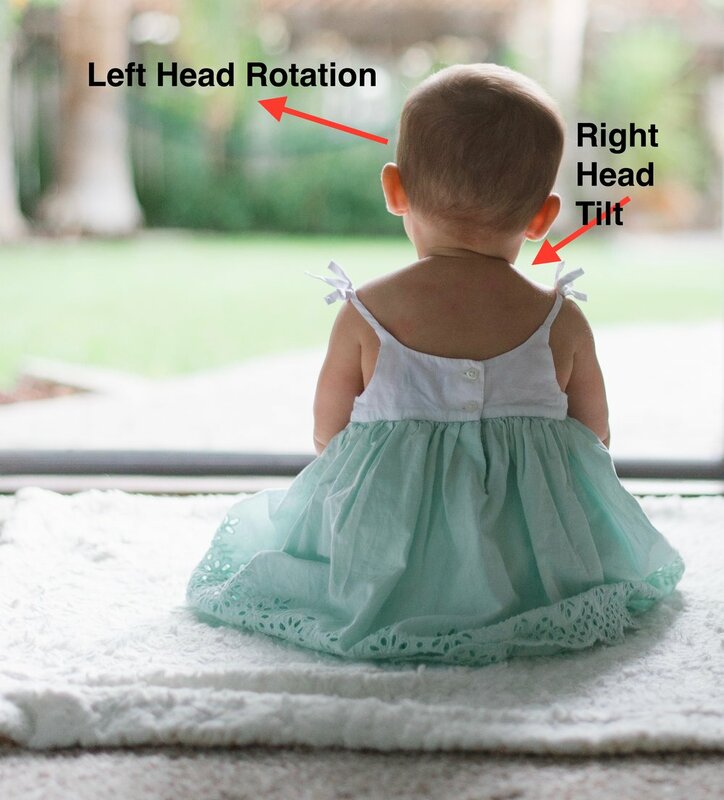 What are common signs of Torticollis that can I look For In my Baby? Increase amount of time spent awake on tummy. Check out this Tummy Time blog post for more info! Get involved in baby wellness classes. 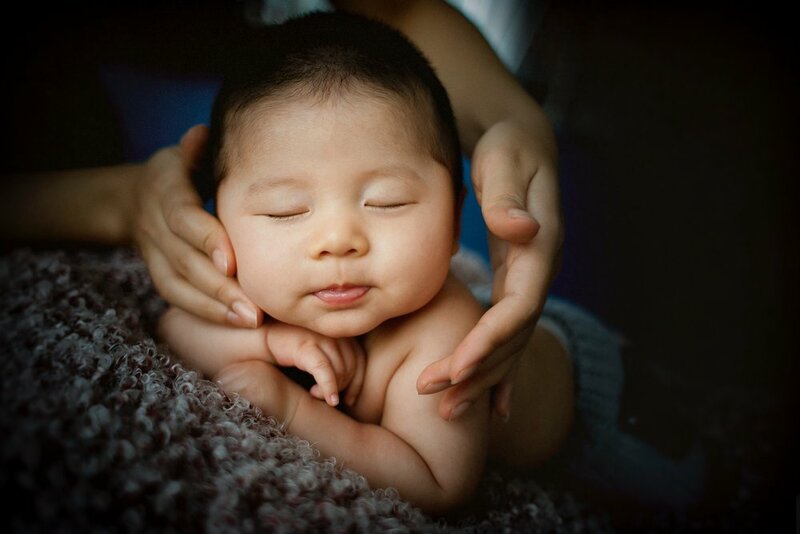 If your child appears to be moving his head/neck in both directions evenly, able to sustain Tummy time for 20 min/day (this does not have to be consecutive), lifts his head against gravity evenly to both sides, and is reaching with both hands equally, that is excellent! If you feel like you are unsure about any of the above information, contact me and I can give you a hand. We can decide if a physical therapy evaluation is necessary or if you can learn through our wellness classes. By learning techniques to improve tummy time, arm/shoulder/neck strength and carry techniques through wellness classes, you can give your child the advantage during this crucial period of growth and development. Prevention is the key to your baby's health over the lifespan!!! Early identification and management with your healthcare professional. A physical therapist is able to target specific muscles that need to be strengthened and stretched. Physical therapy will also provide the parent with an exercise program so the family can continue to help your child throughout the daily routine. For more information on torticollis, head and neck positioning, tummy time, wellness classes or physical therapy, please contact me or book a free phone consultation today!